Longines has been a staple for luxury watch lovers for many generations as well as a longstanding family-operated business. From the traditional style to the new and innovative look of today, their style has encompassed looks along with astonishing functionality. If you are looking for a watch you can buy any timepiece. But if you are looking for a work of art with character, uncanny design, streamlined precision, and durability, then you want a Longines. Longines watches showcase beautiful scratch resistant sapphire crystals, stainless steel, and a choice in band style. There are many styles in their men collection -- you can choose from their Traditional, Sporty, Elegance collections, and more. The Conquest Classic collection for men yields their classical designs with intricate detail to quality and function. The sleek lines and and sophisticated style makes these designs stand out from any other. For a more sporty look, the Hydroconquest collection will fit you to a "T". This collection will give men the stylish look and diver's watch quality in one. The women's collection also has something exquisite and special for any distinguished woman of taste. The La Grande Classique collection is to die for. From the classic band style of stainless steel, alligator skin, and to the diamonds that sparkle like the stars, any woman would love to have this amazing timepiece. Longines has an amazing way of taking fine stones and precious metals to create pieces of artwork to adorn on your wrist. The Conquest Classic collection has additional selections for your eyes to feast upon, such as a silky rosy pink 18K stunning gold band. Both the men and women collections of watches are elegant with classical looks that are timeless. 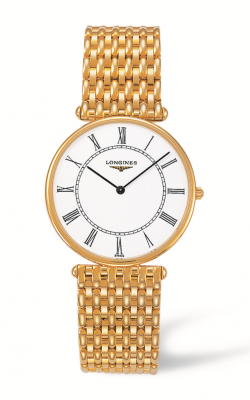 Why Shop for Longines Watches at Northeastern Fine Jewelers? All of Longines’ extraordinary watch collections can be found at Northeastern Fine Jewelry. Stop by and peruse the beautiful collection in person, and see the greatness of a Longines crafted watch. Our staff is here to serve you hassle free. In addition, every staff member is fully skilled and knowledgeable. We offer personal assistance in created unique designs just for you, timepiece repair, and appraisal services if needed. We are located at several convenient locations such as Schenectady, Glen Falls, or Albany, New York. If you have further need of assistance or just have questions will be glad to assist you; simply contact us at 1-855-795-NEFJ. You may also peruse our many pieces of fine jewelry and watches on our website.